Skin biopsy is performed in order to obtain tissue for further examination in the laboratory, typically through microscopy or tissue culture. Because of the relatively low risk of skin biopsy as compared with biopsy of other organs, and the ability to obtain a sample under simple local anesthesia, a skin biopsy can be safely and routinely performed in an outpatient or ambulatory setting, as well as an inpatient setting. The usual intent of skin biopsy is to further characterize the nature of a skin growth or eruption and assist in diagnosis by allowing histopathologic evaluation of a tissue sample. After local anesthetic is administered, the tissue is removed and placed in a specimen container with an appropriate fixative, usually 10% formalin for permanent section diagnosis or Michel’s solution for immunofluorescence. The specimen is then sent to a pathology laboratory, where, after tissue fixation, slide preparation, and staining, a pathologist, dermatologist, or dermatopathologist can examine the specimen under a microscope. Alternatively, the tissue is placed in normal saline rather than a fixative for viral or bacterial laboratory cultures. A skin biopsy is indicated to evaluate cutaneous growths when malignancy is a concern or to confirm the type of a known malignant growth (eg, basal cell carcinoma, squamous cell carcinoma, melanoma) prior to a more invasive surgical procedure. Skin biopsies are also indicated for cutaneous eruptions to help clarify the diagnosis when multiple etiologies are being considered. The best biopsy to assess an eruption, as opposed to a tumor or growth, is a punch biopsy owing to the ability to evaluate the epidermal, dermal, and subcutaneous tissue for histological examination. A punch biopsy is accomplished with a circular or elliptically shaped blade that is driven vertically into the skin in a direction perpendicular to the cutaneous plane, usually to the level of the subcutaneous tissue. The punch instrument can be used for diagnostic and therapeutic purposes. By definition, a biopsy is used to sample tissue in order to investigate a clinical lesion or eruption further, but not necessarily to attempt complete lesion removal. At times, however, a punch biopsy removes the entire skin lesion. A shave biopsy, in which a blade is used to remove epidermis and partial or complete dermis with a horizontal and partially oblique direction, allows for evaluation of the epidermis with or without the superficial dermis but does not provide a great representation of the subcutaneous tissue compared with other biopsy methods. The image below depicts skin anatomy. Skin biopsy is rarely contraindicated. Complications to skin biopsies include bleeding at the biopsy site, hematoma, or infection. Pressure dressings and ice can be used to help alleviate symptoms associated with bleeding or hematomas. In some cases, a suture is used to aid in hemostasis, particularly after a punch biopsy greater than 3-4 mm in width. Clean uncontaminated skin procedures are associated with low rates of surgical site infection (overall incidence of < 5%). Some locations of the body are associated with higher infection rates, and guidelines have been proposed for these cases. Although uncommonly necessary, antibiotics can be started in the event of a resulting infection. The area of biopsy heals with some degree of scarring, and this should be discussed with the patient beforehand. 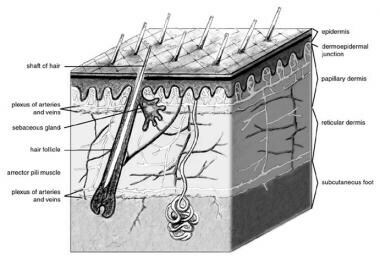 A shave biopsy heals over the course of several weeks with crusting, eschar, and some minimal temporary pain during the course of healing. It ultimately leaves a hypopigmented or hyperpigmented scar roughly the size of the shave biopsy; the scar may be depressed depending on the depth of the shave biopsy. A punch biopsy also typically heals with a smaller, round scar, usually slightly smaller than the size of the punch instrument used. Healing time for a punch biopsy may be shortened and the scar may be lessened by using sutures to close the full-thickness wound. Blakeman JM. The skin punch biopsy. Can Fam Physician. 1983 May. 29:971-4. [Medline]. [Full Text]. Alguire PC, Mathes BM. Skin biopsy techniques for the internist. J Gen Intern Med. 1998 Jan. 13(1):46-54. [Medline]. [Full Text]. Robinson JK, Hanke C, Sengelmann R, Siegel D, eds. Surgery of the Skin: Procedural Dermatology. 3rd ed. Philadelphia, Pa: Saunders; 2014. Roenigk RK, Ratz JL, Roenigk HH, eds. Roenigk's Dermatologic Surgery: Current Techniques in Procedural Dermatology. 3rd ed. Boca Raton, Fla: CRC Press; 2007. Colaric KB, Overton DT, Moore K. Pain reduction in lidocaine administration through buffering and warming. Am J Emerg Med. 1998 Jul. 16(4):353-6. [Medline]. Fein JA, Boardman CR, Stevenson S, Selbst SM. Saline with benzyl alcohol as intradermal anesthesia for intravenous line placement in children. Pediatr Emerg Care. 1998 Apr. 14(2):119-22. [Medline]. Zuber TJ. Punch biopsy of the skin. Am Fam Physician. 2002 Mar 15. 65(6):1155-8, 1161-2, 1164. [Medline]. Illustration of punch biopsy being performed. Equipment used for a punch biopsy. Illustration of a shave biopsy being performed. Illustration of shave biopsy being performed. Equipment used for a shave biopsy. Skin punch biopsy. Procedure performed at Johns Hopkins Medicine. Video courtesy of BroadcastMed (https://www.broadcastmed.com/neurology/5225/videos/skin-punch-biopsy-procedure-johns-hopkins-cutaneous-nerve-laboratory).